The Dog-Lovers in the crowd were looking for a costume truly fit for the leader of the pack. 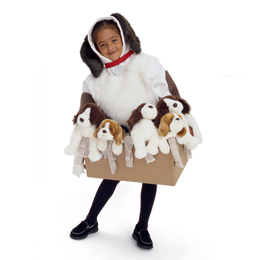 We knew we’d hit the mark with this box full of puppies when five-year-old Bryce’s eyes lit up. “I’m going to take all of my dog buddies with me!” he exclaimed. “And I’ll bark when I walk!” chimed in his classmate, Michaela, age five. Cut a large piece of faux fur for a chest patch and several smaller patches for the arms, back, and hood. Attach them to the sweatshirt with double-sided carpet tape. For dog ears, cut long rounded fur shapes and safety-pin them to the hood as shown (A). Cut off one leg from the tights and loosely stuff it with fiberfill. Safety-pin the open end to the back of the sweatshirt. Cut a few more patches of fur and tape them to the tail. Attach Velcro strips to the ends of the belt webbing or ribbon. For a tag, wrap the cardboard circle in aluminum foil, punch a hole through it, and loop a piece of floss through the hole. Safety-pin the loop to the inside of the collar. Select a box that your child will easily fit into and still be able to walk comfortably in. With the utility knife, cut the box where indicated (B). Poke holes through the box for the rope suspenders and attach the rope, as shown. You may have to adjust the lengths to fit your child. Masking-tape newspaper strips around the top of the box as shown (C). Finally, use pipe cleaners to attach the stuffed dogs to the box and each other, as needed. It may be Halloween, but you won’t find a single treat in this giant sack of groceries. Instead, this bag of tricks will fill the bill for kids who love the gross-out factor. Cut the bottom off the leaf bag. If there’s lettering on the bag, turn it inside out. Measure the opening at the bag’s top (the one shown here is 15 by 12 inches) and cut a piece of cardboard that is the same width but 4 inches longer (ours is 15 by 16 inches). Fold up 2-inch flaps in the front and back of the cardboard. Cut a hole in the middle of the cardboard big enough for your child to fit through. Apply double-sided foam tape to the flap backs and stick the cardboard in place inside the very top of the bag. Fold the ribbon in half and join the fold with double-sided foam tape to the underside of the cardboard insert near the back of the bag. Make a milk carton hat by creasing the white poster board as shown and then cutting an opening for your child’s face in the front panel. Shape the creased poster board into an open carton, sticking the edges together with double-sided clear tape. Then pinch and fold the upper edges, as shown, and staple the carton top closed. Now fill the top of the bag with Gross-eeries by decorating assorted clean, empty food containers with handprinted or downloadable labels, such as Sour Milk, Surreal Cereal, Rotten Eggs, and Nasty Nibbles. You can download Gross-eerie Labels here. Tape the items to the inner bag. Once your child has stepped into the finished costume, use the foam tape to secure the loose ends of the ribbon to the inner front of the bag to make shoulder straps. Make rotten sausage links by inserting inflated balloons into a long stocking leg and tying knots between the links. You can even tape on foam packing peanut maggots (yuck!). Cut a hole in the front of a box and add a rubber rat, tape rubber cockroaches to the bag, or stuff a rubber chicken in among the other Gross-eeries. Create a slimy blob of egg yolk by mixing 1 part yellow acrylic paint with 3 parts white glue. Cover a piece of cardboard with plastic wrap and pour the glue mixture over it. Let the mixture dry for 1 or 2 days, then peel it from the wrap and glue it to the bag. 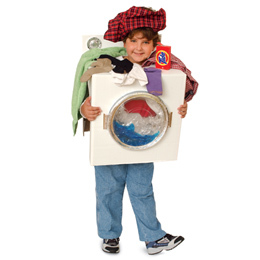 Kids can’t resist airing their family’s dirty laundry in a cool appliance that’s loads of fun to wear. Seal one end of the box shut with packing tape. With the box knife (parents only), cut the flaps off the other end. Save 1 flap. Cover the outside of the box and the reserved flap with white Con-Tact paper. Trace a paper plate onto the middle of the sealed end of the box and cut out that circle. Sketch and then cut out the arch-shaped armholes. To make the door, trace one of the plastic plates or lids in the center of the front of the box. Cut a hole 1/2 inch smaller than the diameter of that circle. Crumple both pieces of cellophane. With the bottoms of the plates facing out, sandwich the cellophane between the plates. Seal the edges of the plates with foil tape. Attach Velcro to the box on each side of the circle cutout. Put the corresponding pieces on each side of the plates. Stick the door on the washing machine. On the right-hand side of the door, cover any exposed Velcro with foil tape. On the left side, place tape over the Velcro and the door so that it acts as a hinge. Use the hot-glue gun to attach the flap to the back of the box. To make a dial and knobs, tape 1 plastic bottle cap to the center of the plastic lid. Cover it and the 2 other caps with foil tape. Draw details on the dial with the marker. Attach the caps and dial to the back flap with the hot-glue gun. Accessorize! Velcro or tape an empty detergent box to the top of the washing machine. Pin together 5 or so socks to make a sock necklace. Put boxer shorts on your child’s head or pin more socks to a hat. Tuck other laundry into the neck hole. No cookie-cutter costumes here! Our sweet cookie sheet begins with lightweight foam core and silver poster board. We tied a ribbon wrist loop to the cookie kid’s spatula so she has a hand free for trick-or-treating. Cookie Cutie – Step 1 THE COOKIE SHEET On the back of the poster board, pencil a line parallel to each edge, then make a cut at each corner. Turn it over and fold along the lines (a yardstick is a handy folding tool). Overlap and stick the corner flaps together with doublesided tape, then trim off the points. Use a craft knife to trim the foam core board to 27 inches long and round the corners. Attach it to the back of the poster board with double-sided tape. THE COOKIES Duct-tape the brown craft foam together, long sides adjoining. Draw a large cookie on the taped side, then cut it out. Trace the face opening onto the cookie sheet. Score the line with a craft knife, then go back over it until you’ve made a clean cut through the foam core. Cut out 4 smaller cookies (we traced a 5 1/2-inch cookie cutter) and 3 red craft foam buttons. Stick the cookies and buttons in place using double-sided tape. Add details with the dimensional paint. Let it dry for at least 4 hours. halfway down the foam core. 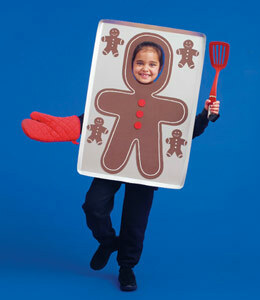 Stick 3 Velcro strips on the lower corners of the board, then have your child try on the costume. Cross the straps over her back, then pull them down. When the face opening is at a comfortable level, stick 2 Velcro strips to each strap where they’ll stick to the Velcro on the board. Trim any excess ribbon. 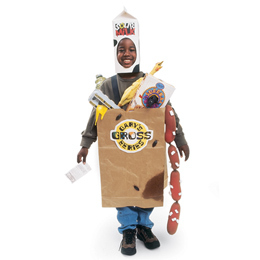 You can find many more Halloween costume ideas at Family Fun. I’ve also posted more costume ideas here.